But a new technique developed by Scott Oliver, MD, assistant professor at the University of Colorado School of Medicine, may change all that. Oliver has discovered that silicone oil applied inside the eye can block up to 55 percent of harmful radiation, enough to prevent blindness in most patients. Oliver focused on choroidal melanoma of the eye or uveal cancer, the most common and dangerous form of a disease that strikes over 2,000 people each year. It can spread quickly to the liver and lungs which is often fatal. 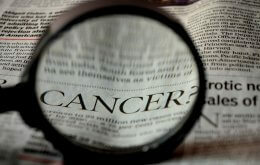 The cancer can occur in people of any age – fair skin and sun exposure are thought to be a leading cause. Physicians often treat it with a technique called plaque brachytherapy. Surgeons attach a gold cap containing radioactive seeds to the white part of the eye. For one week the radiation slowly incinerates the tumor but it also causes long-term damage. In his quest to save their eyesight, Oliver experimented with a series of substances that would block radiation from striking critical structures while allowing it to hit the tumor. He discovered that silicone oil, already used to treat retinal detachment, could screen out a majority of harmful radiation. “You don’t have to block out all the radiation to protect the eye because the vital structures in the eye can tolerate low doses of radiation,” he said. Oliver experimented on cadaver eyes and tested the oil on animals in the laboratory and found no harmful side-effects. Faculty at the University of Colorado Denver School of Medicine work to advance science and improve care. These faculty members include physicians, educators and scientists at University of Colorado Hospital, The Children’s Hospital, Denver Health, National Jewish Health, and the Denver Veterans Affairs Medical Center. Degrees offered by the UC Denver School of Medicine include doctor of medicine, doctor of physical therapy, and masters of physician assistant studies. The School is located on the University of Colorado’s Anschutz Medical Campus, one of four campuses in the University of Colorado system. For additional news and information, please visit the UC Denver newsroom online.